This article is mostly going to be a memoir of my family's early experience with American Flyer S-gauge trains, why some of those pieces still have a soft place in my heart, and the potential for recreating a tiny bit of that history in our new home. Note About Train Values: Whenever I post this sort of article, I start getting questions from people who have inherited old sets and want to know what they're worth. The short answer is that I don't know, but I know what you can do to find out for yourself. Check out the article "How Do I Sell My Train Collection?" for some tips. I have also posted RSS feeds of American Flyer locomotives and train sets on eBay that may help you find out what sets like yours are going for. (That's what is scrolling on the right side of the page.) "Watch" the pieces and sets that look like yours and see what they actually sell for, not what people are asking. Some folks start out very low, but the sets wind up going for hundreds of dollars more than the first bid. Other folks post the set very high, and just keep relisting it because it never actually sells. When the sets actually change hands then you can start to establish a "price point." Dad and Trains - Dad grew up around real trains. In fact his father drove Berkshires and other steamers for Nickel Plate for a time. When my dad was a boy during the Great Depression, his family also had electric trains. For a time. They were big metal ones. A half-century later, Dad told me that they were probably standard gauge, but he wasn't sure, because once when times were rough, his dad gave them to an auto repair shop as collateral for a car repair, then never bothered to pay the bill. Getting anything of serious value in exchange for a used train set may sound strange nowadays, but in those days, a good train set cost as much as a refrigerator. And in the pre-television era, the family train set was a major investment in what later came to be called "quality time." Dad Passes the Torch - When I was a boy, about 1957, Dad figured it was time for "my" first train set. Remember, a boy's first train set was even more a "rite of passage" in those days than a boy's first BB gun (A Christmas Story notwithstanding). They were sold in department stores and hardware stores, as well as in mail-order catalogues. HO was still in its infancy, really, and those trains were definitely too fragile to give to a five-year-old. But Dad was also put off by Lionel trains - not only did he dislike the third rail, but the proportions of Lionel's starter set trains all looked goofy to a person who had grown up around real trains. The short version is that in 1957 the only train sets remotely proportioned like real trains that could also survive handling by young people were made by American Flyer. Our first train set included a Reading #303 Atlantic (4-4-2), two freight cars, and a bright red center-cupola caboose labeled "American Flyer." The train set came in a box with a transformer and an oval of tinplate track. There was also a little bottle of "smoke fluid" that we only used a time or two because Mom wasn't exactly delighted by the smell. I learned later that the Reading Atlantic was the default "starter set" locomotive for AF (at a time when Lionel was packaging way-undersized 2-4-2 "Hudsons" with their starter sets). The earlier AF Atlantics had die-cast metal locomotive shells and stamped-steel tender bodies. None of the Atlantics ever had full valve gear, as far as I know. But except for that detail, the molded-on hand-rail, and the stock drivers with the big white rings, it was as accurate a scale model as many that were being made in HO at the time, and far closer to a scale model than any Lionel starter set then in mass production. Dad's Longterm Plan - A "Depression Baby" whose upbringing trained him to feel guilty if he spent more than a tiny amount of his factory income on anything that was "just for fun," Dad had the idea of building up our family's train set collection the same way he had built up our family nativity years earlier. He would buy enough pieces to get started, then buy another piece or two every year, as the family could afford them. So the next year, I got another car and more track, and so on. In the meantime, we made our own accessories, building factories out of cardboard boxes, painting pine cones green to create forests, and so on. Little did Dad know that within a few years, American Flyer would be all but defunct, and the notion of building the railroad up a little bit at a time with new products from the store would no longer be viable. Dad did make one other large investment before that happened - another starter set, for my little sister Kathy. It was pulled by an 0-6-0T "Docksider," which had plastic drivers and metal shoes that were supposed to pick up the electricity. ("Supposed to" was the key phrase in that sentence.) Not the best design decision for a company whose trains usually ran like champs. That set also came with a couple of freight cars, the standard Flyer caboose, an oval of tinplate track, and a transformer. Soon after, my bedroom floor was covered with track and home-made accessories. Both trains ran on concentric loops, although we had switches we could use to drop off cars at our little factories or at the grain elevator I made with paper towel rolls. S Gauge Railroading During the Collapse of American Flyer - Then the family moved. At the new house, I was given the biggest bedroom, so we could set up our railroad there. Somewhere Dad had accumulated two old kitchen tables he didn't mind sacrificing for the cause, and we built a 4'x4' table to fit into a corner. We rolled out several sheets of paper with green sawdust glued to it, built a chicken-wire and plaster mountain, and started tacking down track in two concentric loops that were shaped something like very fat "T's". I was saving my chore money for purchases, but by then, most of the AF trains I wanted were either expensive or out of production. Within a few years, they were all out of production (if you didn't count "Pikemaster" trains, which, frankly, didn't really count). Then someone advertised used AF trains in the newspaper classifieds (remember those)? And we went over. I bought a plastic-bodied USRA-inspired CNW Pacific (4-6-2) #283 and a set of green heavyweights. Like my Atlantic, the Pacific lacked valve gear and had "whitewall" drivers, but it ran like a champ and would pull more cars than we could fit on the biggest loop we had. Plastic Communities - We also bought and painted up a city's worth of Plasticville buildings and citizens. Memory fails, but I think several of the buildings came as a set in the same box. The Citizens came unpainted in a box like the one at the right. BTW, we were already familiar with Plasticville's manufacturer Bachmann through their realistic plastic bird models that came with dots of solid paint on a plastic base and a bottle of some solvent (probably acetone, now that I think about it). If memory serves, the Plasticville "citizens" came the same kind of paint. 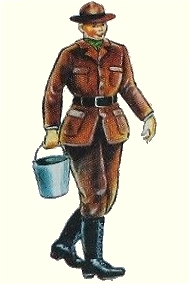 One of the "citizens" was apparently supposed to be a Scout leader, wearing a Boy Scout uniform, carrying a bucket, but as tall as the other "adults." I thought he looked silly, so I put him in the "woods." Then Dad put him back in the "town." It became a game - every few days I'd hide him in some other part of the layout and Dad would look for him and move him somewhere else. Or vice versa. I'm sure Bachmann never had that game in mind when they created the silly little figure, but it is an indication that when you have a pastime that involves creativity from the get-go, things can go in directions you'd never expect. Pennsylvania Dreams - Though I liked my Reading-inspired Atlantic, with a firebox that made it look like a pregnant guppy, my tastes in railroads gradually migrated toward the Pennsylvania RR and its Belpaire fireboxes. If you ignore the Marx-quality Pikemaster D16sb (as you should), AF only ever made two Pennsy-inspired locomotives, a Pacific and an 0-6-0 with slopeback tender. 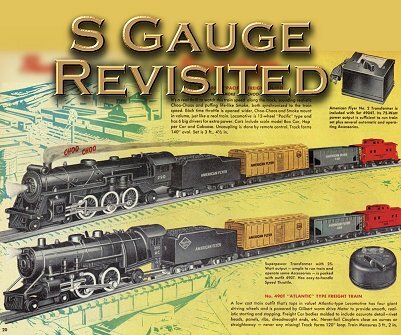 Eventually, shopping the back of S Gauge Herald magazines, I came up with one of each. 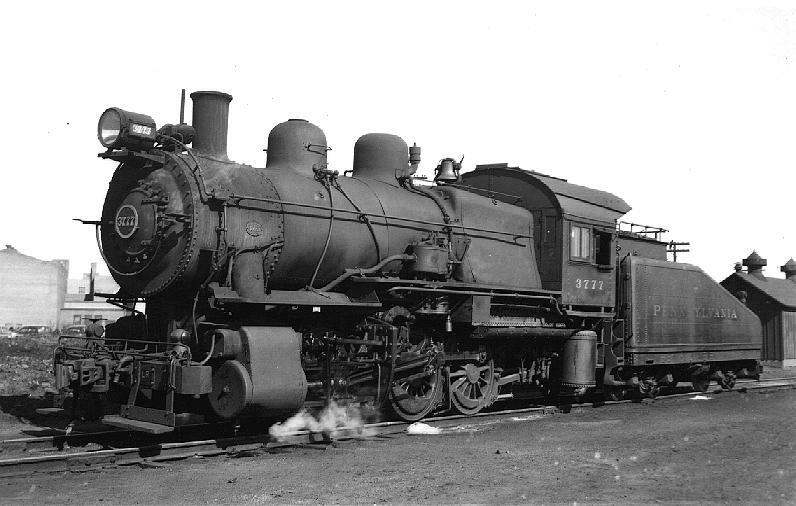 The K5 had a diecast engine and tender and full valve gear (though it still had those "whitewall drivers"). Like the USRA-inspired Pacific, it ran like a champ. It soon became my favorite locomotive. Later, I learned that PRR, who had made hundreds of K4 Pacifics, only made two K5s. Ironically those "superPacifics," which used all the latest technologies, were so successful that PRR stopped building Pacifics altogether and used most of the specifications from the K5s to design their successful multi-purpose "Mountain" class locomotives. At the time, though, I was so prototype-minded that I was just disappointed that AF hadn't made a model that I could justify having more than two of on my railroad. As though anybody but a die-hard Pennsy nut would ever know the difference between a K4 and K5 anyway. The 0-6-0 was also a nice scale model of Pennsy's iconic B6sb "shifter" with the slope-back tender. That is if you discount the partial valve gear, the whitewall drivers, and the motor that stuck out of the back of the cab. Unfortunately, mine was glitchy - there was a short that I could never track down even when I completely disassembled the thing. I could only get the engine to run by leaving out one of the screws that was supposed to hold the motor together. For years I figured that I had just bought a lemon, but I've since heard from at least one other owner who reported similar problems. HO Emerges as "The" Scale Model Railroading Standard - By the time we were making a serious effort to operate a "scale" model railroad, HO had come into its own, and totally dominated the hobby magazines. Which wouldn't have been a problem, but some HO scalers made a point of letting us know, often, that they were modelers and we were just "playing with toy trains." 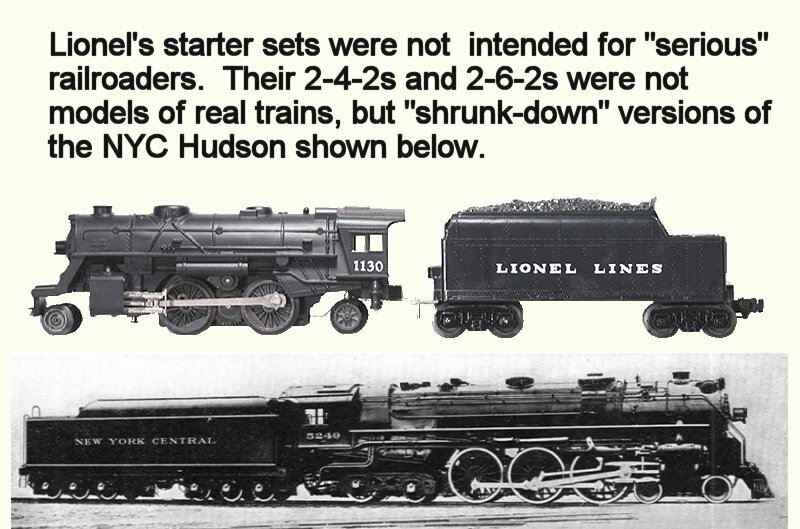 They classified American Flyer's well-proportioned trains in with the offscale, undersized toys being made by Marx and Lionel at the time. I did like the look of the "superscale" kits you could buy from Kinsman and others, and I ordered and built two outside-frame reefers. Plus I built three scale-length coaches using Northwestern milled number. (I confess they looked very silly on the Flyer curves, though). That said, when I looked at starter HO sets in the hobby shops or friends' bedrooms, I couldn't help noting that almost everything HO scalers held against my Flyer trains was also true of the HO starter sets - molded-on handrails and roofwalks, oversized flanges, and funny-looking couplers to name a few. Yes, there were some magnificent models coming from Pacific Fast Mail or wherever, but those were hardly the norm. I wasn't impressed by the growing notion that you couldn't build a "true" scale railroad unless you used HO, but I admit, I did take it as a sort of challenge. In addition to building several cars that were "scale" by anybody's definition, I attempted to make my USRA Pacific look a little more like a scale model by filing down the molded-on hand rails and putting on separate wires, painting the whitewalls, painting the shells, adding scale water pumps and pipes, and even carving out the openings in the pilot steps. I didn't have the engineering skills to install valve gear on the thing, and much of my work was admittedly clumsy - I was probably about fourteen at the time - but I did prefer the look of the thing after my rework. Later I learned that the metal versions of the USRA pacific already had separate handrails, although none of them ever had valve gear, to my knowledge. In the meantime, a group of S gaugers was trying to raise money to get a scale Nickel Plate Berkshire built. It took them a long time to track down a factory in Japan that would build what they wanted, and the cost was going to be substantial. Dad watched their project with great interest, as the Berkshire was one of the locomotives his father had driven "back in the day." Eventually, Dad lost interest in our S gauge project, especially when he realized that he could afford to buy a European-built "AHM" HO Berkshire for about a fifth of what the S scale product was probably going to cost. Dad also liked several other prototypes that were not available in S and would likely never be. He finally decided that if he was ever going to have the railroad empire of his dreams, he would have to go to HO. Things Get Split Up - By the time I graduated college the first time, Dad was getting ready to retire and move to Michigan, ostensibly to be closer to my sisters (though where he eventually settled wasn't all that close to anybody). We disassembled both railroads and boxed everything up. Dad set up an HO railroad in the basement of their new home in Michigan, using some of ourhandmade buildings and accessories that looked good with HO scale trains. Unfortunately the basement was damp and hard to get to, and it got harder as Dad got older. I was in no position to help, either, living nine hours away. The Plasticville and American Flyer, which Dad had no intention of setting up, all fit into four cardboard boxes. I was living in apartments at the time, so Dad and Mom stored them for the time being. Then Shelia and I got married and bought a tiny house, and the stuff came our way. There was no room or time to set up a railroad of any kind for those years, and when I did get trains out to run, I discovered that I was spending more time on maintenance than I was on running them. A friend who collected Flyer made me an offer and I sold all but a very small box-worth of it to him. Ironically, my younger sister's Docksider was the most valuable piece in the "collection" - it turned out that the Docksiders' poor operation caused Flyer to discontinue them, and caused a number that did get sold to wind up in the trash. So it was the rarest piece of all. My sister was glad to get her share of the sale, since she wasn't in any danger of running trains at that time, either. More Boxes and Moves - The small box of "keepers" came with our family when we moved the next time, but it went right to the attic and only came down once or twice before we moved again. In the meantime, I started a railroad outdoors with much larger trains (that I stored in the garage). I also started the FamilyGardenTrains.com web site to help other beginners in that hobby. Eventually Dad's health caught up with him and he had to leave the farm where he had set up his railroad in the basement. After both of our parents died, Dad's trains came to my house in boxes. But Shelia and I were not getting any younger, either. A few years ago, we started looking for homes we could afford that had the master bedroom on the main floor. Unfortunately, we had also owned two very charming homes and we frankly had the time to be "choosy." After several years of checking out one or two places a year and the online postings of hundreds of others, Shelia saw an ad for a house she thought would serve our purposes. I met her over there on my lunch hour and agreed with her. We made an offer the first day. Then we put our old house on the market. Moving in and selling the old house took much longer and cost much more than we had expected, but eventually it happened. Why is that important? Because our oversized garage at the new place gives me room to set up an indoor railroad if I want to. If I do, it will be small, with just my favorite S-gauge pieces, and maybe even a loop of Lionel track for the two old Lionel trains that have also come into my posession - after all, the trains themselves are only slightly bigger than my Flyer trains. In the meantime, I found good homes for all but Dad's Berkshires and a few other favorite pieces, which I kept in case my adult children ever settle down and want a piece of Dad's history. More Berkshire News - So here's a final irony. While I was away from the world of American Flyer, Lionel (their current owner) went and made a Berkshire - the same locomotive my Dad left S scale for. It started as part of their Polar Express line, but was also sold individually with real-world railroad names. Yes, I knew that Lionel made an O27 Polar Express set that was fairly nice. They also made a very off-scale plastic battery-powered set that runs on G gauge track (I own one of those I let young visitors run). But I didn't realize until recently that Lionel ever made one in S scale. What's more - in keeping with Flyer's historical respect for realistic proportions - the Berkshire's profile looks pretty close to scale. They're just about unavailable, but they are surprisingly well designed. The handrails are molded on (sadly), but the valve gear and many other details are very nice. That said, it's not a toy - it's more like someone scaled up an HO model than replicated the rugged old AF trains. The coaches would probably stand up to handling by anyone 6 and up, but I would recommend an adult putting the locomotive on the track. In case you wondered, about 19 railroads used Berkshires that were very similar, all made in Lima, Ohio. The Pere Marquette locomotive that the Polar Express was patterned after was very similar to the Nickel Plate Berkshires that Dad had admired. In addition, the two railroads often cooperated in various ways while they were active. On his HO railroad, Dad sometimes ran Pere Marquette and Nickel Plate equipment side by side, which was, theoretically possible even on the real railroads. And here's a kicker - Lionel made both road names for the American Flyer line at one time, though I think most or all of the other road names have been snatched up by collectors. They have also made an "American Flyer" USRA 2-8-8-2 in N&S colors, Dad's other favorite locomotive. Sadly, Dad passed before either of those were available. I've included a "builder's photo" of one of the Pere Marquette Berkshires, so you could compare the model to the reality if you so desired. By the way, when Lima Locomotive Works and most other real-world locomotive manufacturers wanted to take a photo of a new locomotive coming off the line, they painted it gray, not black, so the details would show up. In many, if not most cases, they also painted the rims of the drivers white so they'd show up better. Maybe that's where American Flyer got the idea for all those "whitewall' drivers. Without getting out a ruler and calculator, I would say that the boiler may be a little foreshoretened, like maybe 10-15%, nothing like the boiler on, say the Lonel "Large Scale" version, which is about 50% shortened. 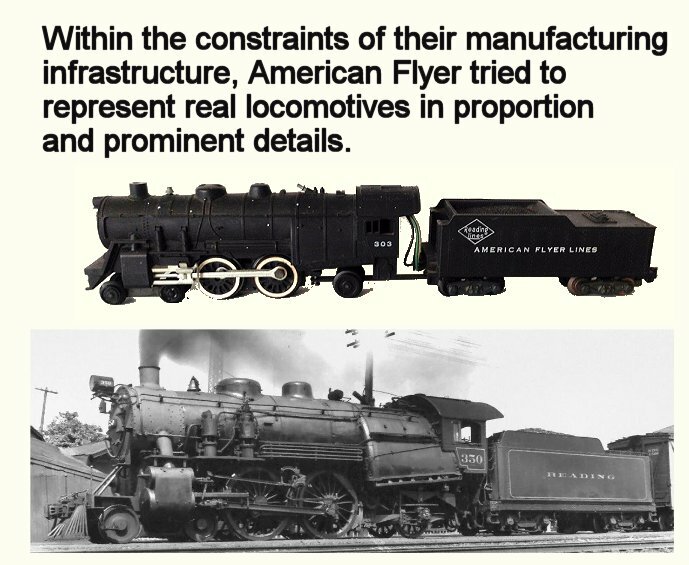 Flyer and Lionel Flyer Manufacturing Practices Compared - Unlike the "old days" when AF kept their molds in storage for years in case they wanted to reintroduce a model, the "Lionel American Flyer" locomotives like the Berkshire seem to come in one or two batches, never to be seen again. Which would be a shame, since the Lionel AF Berkshire is actually a very nice model of a real train that nevertheless looks good alongside traditional Flyer. I did take a couple quick photos to help visually compare the Polar Express pieces to similar vintage AF models. The coaches are very close in height and width, with the Polar Express coach being about 1.6" longer. The latter does not have the molded-on "diaphrams" of the vintage model, but I'm not sure you miss them. Other than that, the detailing is similar and very nice. The die-cast trucks are not only better than the stamped-metal trucks on the coach shown - they're nicer than the die-cast trucks that AF replaced them with when they went to knuckle couplers. Surprisingly, the trucks are mounted closer together on the newer car. For a locomotive comparison, I chose my K5, which is a model of one of the biggest (and heaviest) Pacifics ever made. Like most large late steam locomotives (including the Berkshire), its height and width were limited by existing right-of-way clearances. After a certain point, the only way they could make steam engines bigger was to make them longer. So I figured that, except for length, the vintage AF K5 would be a good comparison to the Berkshire as far as general proportions go. As you can see, except for the molded-on hand-rail, the Berkshire has more detail and and more realistic drivers and trucks than the K5, but the overall scale is about the same. By the way, the Berkshire is very heavy and is definitely not a toy for youngsters. Now I'm not saying that I'm going to get back into S gauge railroading in a big way, but the availability of products of this quality does indicate that I could if I wanted to. Too bad they were several years too late for my Dad to see them, and about fifty years to late for him to run. Each month, we get more interest in the trains and towns we discuss. We welcome your questions as indicators of what we should be working on next (also, we always try to answer reader questions quickly). In addition, if you have any photos, tips, or articles you'd like to share with your fellow hobbyists, please let us know. All of the hobbies we report on grow best when we all learn together. In the meantime, please accept our very best wishes for a great season! To read more, or to look at recommended Indoor or Garden Railroading products, you may click on the index pages below. Note: Family Garden Trains™, Big Christmas Trains™, Big Indoor Trains™, Big Train Store™, and Trains-N-Towns™ are trademarks of Breakthrough Communications™ (www.btcomm.com). All information, data, text, and illustrations on this web site are Copyright (c) 1999, 2000, 2001, 2002, 2003, 2004, 2005, 2006, 2007, 2008, 2009, 2010, 2011, 2012, 2013, 2014, 2015, 2016, 2017 by Paul D. Race. Reuse or republication without prior written permission is specifically forbidden.